The Technivorm Moccamaster 59616 KBG Coffee Brewer is usually compared to the Wilfa Precision Automatic WSP-1A Coffee Brewer because they brew coffee in a similar fashion. Apart from producing high-quality coffee, both brewers use the pour-over technique of coffee brewing with a showerhead water action just above the brew basket. Once water is fed to the water reservoir, it is taken to the boiler where it is heated up to 196 to 205 degrees Fahrenheit. It is then transported to the showerhead, where it drips and soaks up the fresh grounds of coffee in the brew basket. After the extraction, the brewed coffee trickles down to the carafe through a filter. Now, let us look at a detailed comparison between the two brewers. 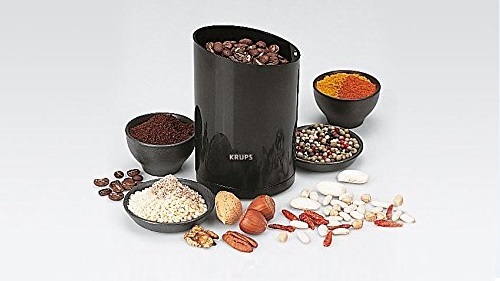 Both brewers feature sleek aesthetic designs that are actually good to look at. They both include a power base that also houses the boiler, showerhead and a place for the carafes. However, there is a slight difference in both designs, which facilitates how water is transported to the showerhead. The Moccamaster 59616 has a boiler lodged on top of the power base and on top of it is a water reservoir that is also permanently installed. Running in the middle of the water reservoir down to the boiler is a dispensing tube. When water is filled in the reservoir, it flows down to the boiler, where it is heated. It is then pumped up along the dispensing tube, which extends to the showerhead. The showerhead is therefore placed directly above the water reservoir in the Moccamaster design. The Wilfa is designed differently, and the water reservoir is not connected to the showerhead in any way. Once water is filled in the reservoir, it flows downwards to the boiler, which is located inside the power base. The water is then heated and transported via a dispensing tube up to the showerhead. Both carafes have the same capacity of 10 cups, which is roughly around 40 ounces of coffee. 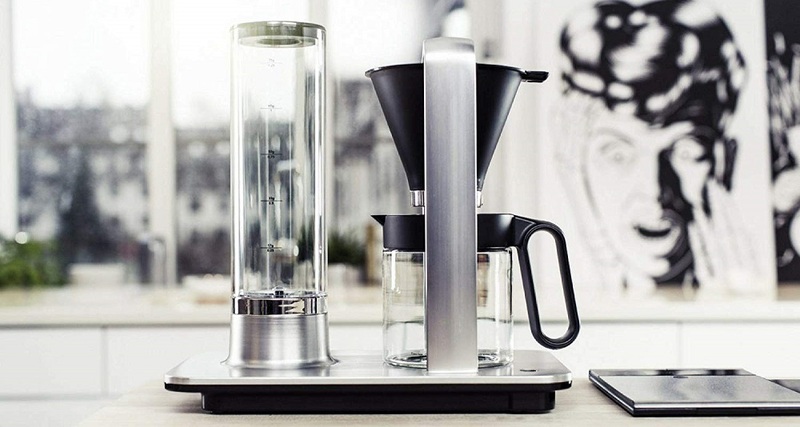 The Wilfa has a glass carafe only, while the Moccamaster comes with either a glass carafe or a thermal flask. 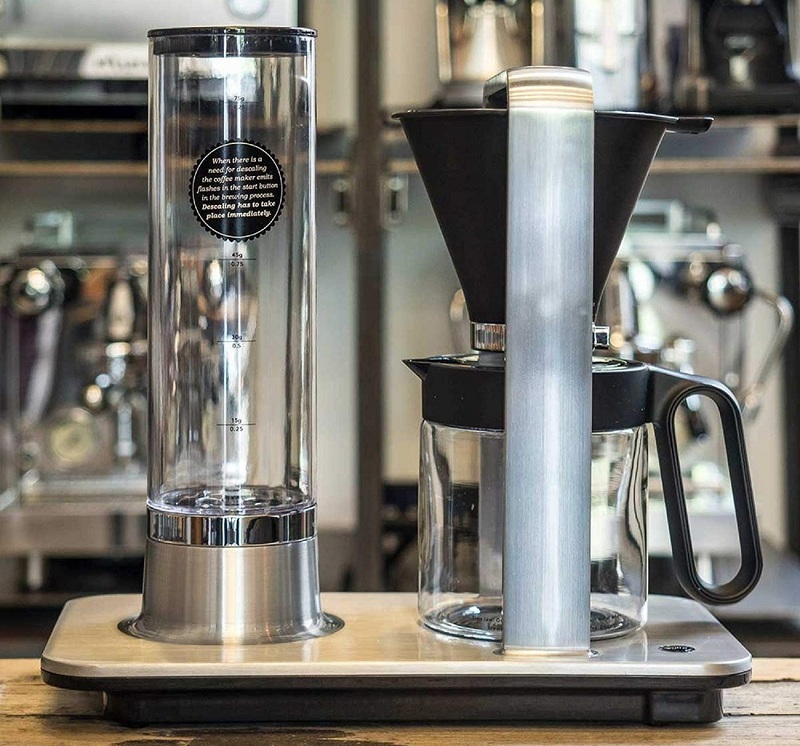 To keep the coffee warm after brewing, both models have warming plates for the glass carafes. Thermal flasks for the Moccamaster do not have warming plates, as they are already heat insulated. Both hot plates have an auto-shutoff feature – the Moccamaster turns off after 100 minutes, while the Wilfa shuts off the hot plate after an hour. Another major difference between the two is the type of water reservoirs they use. The Wilfa has a removable reservoir that you can take to the tap to fill. 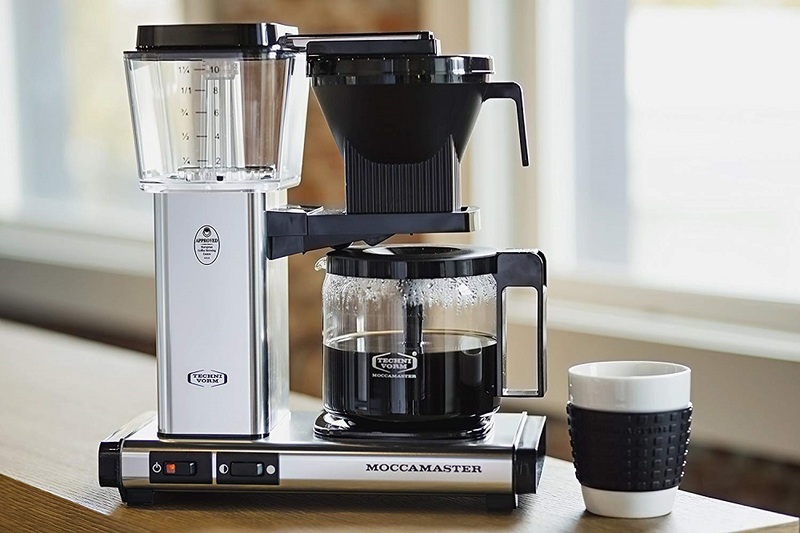 The Moccamaster has a permanently installed reservoir that is connected directly to the boiling system. Furthermore, the reservoir on the Wilfa has a measurement scale that shows the recommended coffee to water ratio. 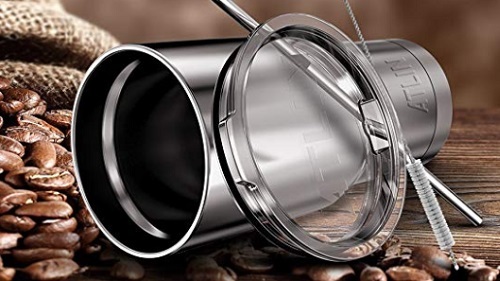 This allows you to get the right measurements for the perfect coffee brew. The Moccamaster has a water measurement scale only. For the coffee, you will have to rely on your own measurements, although the recommended coffee to water ratio is 60 grams for every liter of water. Both the Moccamaster as the Wilfa use Melitta cone paper filters (while you can also buy non-brand paper filters). Paper filters give out a light and flavorful beverage that is clean on the cup, as it filters away oils and particulates. 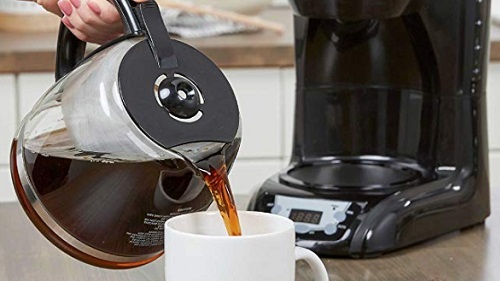 A permanent filter used in other coffee machines retains most of the oils and particles, and as a result, the overall drink is denser and dirtier on the cup, but the taste and aroma of the coffee is excellent. The Wilfa has a flow control adjuster at the base of the brew basket that allows you to cut off the flow to allow the coffee to be steep. You can also use the adjuster to reduce the rate of the drip for the coffee to fully extract. The Moccamaster does not have such a feature. 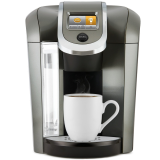 It has an automatic drip-stop function that halts the flow of coffee when the carafe is removed. Though not a decisive point, but it is equally important to understand how the two brewers are manufactured to put the quality questions to rest. The Moccamaster 59616 KBG is handmade, and each unit individually tested for quality, making it one of the most reliable coffee brewers. It also comes with a five-year warranty. On the other hand, the Wilfa Precision Automatic WSP-1A was developed by Tim Wendelboe, a World Barista Champion. It is therefore very reliable and has won the Red Dot Award in 2013 for innovation. It goes without saying therefore that both brewers are great and we are conflicted as to which is greater between the two. You can never go wrong with either choice. However, we would like to point out that keeping brewed coffee on the warming plate could result in bitter coffee in either case. This is due to the development of quinic acid.